Empowering customers to carry out retail transactions locally, with no dependency on international payment schemes. Customers who don’t require international transactions on their debit cards, and only need “Debit Card” to conduct ATM and POS transactions to meet their day-to-day financial needs. Customers i.e. sole proprietor, individual, anyone can operate or either/survivor (in case of joint account) can opt for PayPak Debit Card Variants through their parent ABL branch. PayPak is Domestic Payment Scheme owned and operated by 1LINK (Pvt) Ltd. duly approved by State Bank of Pakistan. 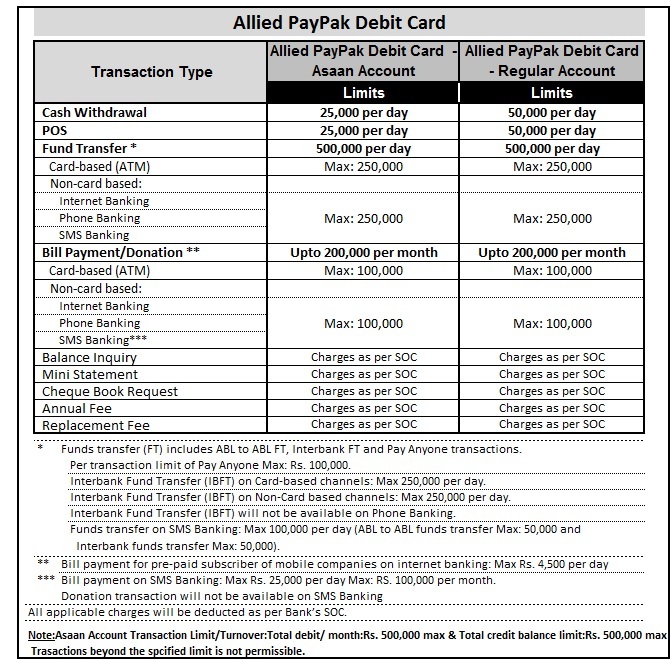 How Allied PayPak Debit card is different from Allied Cash + Shop Visa Debit Card (VDC)? Please call our 24×7 Customer Service at 111-225-225 for activation of your Allied PayPak Debit Card. To generate your PIN and in case you forget your PIN, you can get assistance from Allied Phone Banking at 111-225-225.